Senate to probe clash between DSS, EFCC over arrest of Ex-DSS, NIA Chiefs – Royal Times of Nigeria. 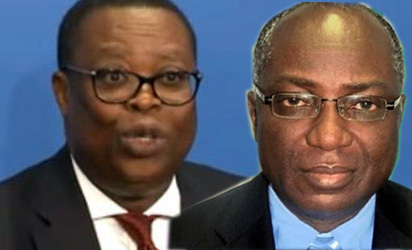 THE Senate has began a probe into the clash, between operatives of the Economic and Financial Crimes Commission (EFCC) and Department of States Services (DSS) over an aborted arrests of former DSS boos Ita Ekpeyong and disgraced former National Intelligence Agency (NIA) boss Ambassador Ayo Oke. Senate President Bukola Saraki who presided, however directed the establishment of the Adhoc committee and gave it two weeks to report back to the Senate. The resolution of the Senate followed a point of Order by Senator Dino Melaye, APC, Kogi West who cited Order 42 of the Senate’s rule. In the motion, Senator Melaye drew the attention of lawmakers to the reported clash between the sister agencies, informing the Senate that DSS agents prevented the EFCC from arresting former Director Generals (DG) DSS Mr. Ekpeyong and NIA Mr. Oke, thereby causing panic.
. Melaye, who described the situation as calamitous, called on the Senate to investigate the circumstances leading to the face off between both agencies. Rising in support of the motion, Senator Abiodun Olujimi, representing Ekiti South, noted that the clash between the two agencies amounted to gross irresponsibility and further indicates that nobody is in charge of the government.